Yurra has delivered a number of significant town centre, public open space, commercial and residential development projects throughout the Northwest. Yurra is actively expanding our Landscape construction footprint to service opportunities throughout WA. Yurra is often engaged early in a project cycle to provide design feedback and budget input. Yurra has developed strong connections with clients and design teams in order to ensure quality and bang for buck are always delivered within our landscapes..
Yurra was awarded the Landscape Construction Contract for this iconic project within the City of Karratha. Working within the town Centre created numerous challenges however it was a significant community project that we wanted to be involved in. 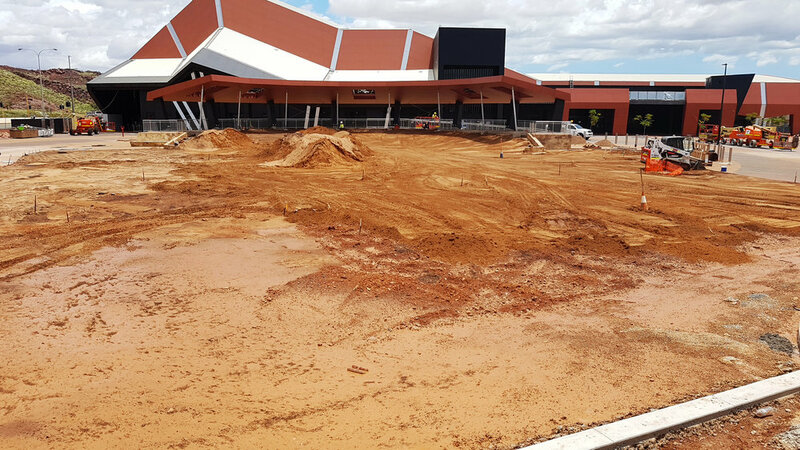 Yurra were engaged by Landcorp to deliver the Karratha Town Centre project works within an extremely tight timeframe leading into the opening of the Quarter. Yurra staff worked around the clock to ensure the outcome was delivered and the park has become an iconic part of the Town Centre. Yurra were the successful tenderer for the BASSA project. Post award the site was inundated by 1.5m of rain over a 1 month period resulting in numerous re-design considerations. Yurra lead the Civil/Landscape re-design process and has since delivered what can only be described as an amazing project outcome.